Los Angeles, CA (January 22, 2018) – Multi-platinum and award-winning artists Daryl Hall & John Oates and Train today announced their momentous co-headline North American summer tour, kicking off May 1 in Sacramento, CA and wrapping August 11 in Seattle, WA. Produced by Live Nation, the extensive trek will make over 35 stops across the U.S. and Canada including Chicago, Philadelphia, Toronto, New York, Nashville, Los Angeles and more. This marks the first time legendary duo Daryl Hall & John Oates will tour together with fellow award winning hitmakers, Train. Fans can expect full sets from both Daryl Hall & John Oates and Train, followed by a showstopping joint set. Tickets for the tour go on sale to the general public beginning Monday, January 29 at 10am local time in most cities on LiveNation.com. Please see below for full tour itinerary and details. “Looking forward to an amazing tour with our buddies from Train and seeing all our fans around the country in 2018," added John Oates. “I’ve known Daryl Hall and John Oates for a few years now and after being their fan my entire life, we now get to tour with them and spend time with legends in the world of music. This will be a career highlight for all of us in Train and a show that you won’t want to miss,” said Pat Monahan. The 2018 tour also marks the return of Daryl Hall and John Oates’ HoagieNation Festival, taking place Saturday, May 26 in their hometown of Philadelphia at the Festival Pier. The annual celebration of food, music and culture will include tour mates Train as well as special guests Fitz and the Tantrums, Tommy Conwell and the Young Rumblers, and more to be announced. There will also be a pre-party Friday, May 25 at the Fillmore Philadelphia, complete with live music and an exclusive culinary experience. Full festival details at www.HoagieNation.com. Daryl Hall & John Oates are the NUMBER-ONE SELLING DUO in music history, according to the R.I.A.A. The duo from Philadelphia has scored six #1 singles, including “Rich Girl” (also #1 R&B), “Kiss on My List,” “Private Eyes,” “I Can’t Go For That (No Can Do)" (also #1 R&B), “Maneater” and “Out of Touch” from their six consecutive multi-platinum albums—’76’s Bigger Than Both of Us, ’80’s Voices, ’81’s Private Eyes, ‘82’s H2O, ‘83’s Rock N Soul, Part I and ‘84’s Big Bam Boom. Train is a multi-GRAMMY and Billboard award-winning band from San Francisco, CA that has had 14 songs on Billboard’s Hot 100 list since the release of their debut self-titled album – hits include “Drops Of Jupiter,” “Hey, Soul Sister” “Drive By” and “Play That Song.” They've sold more than 10 million albums worldwide, more than 30 million tracks, amassed over a billion streams with multiple platinum/gold citations, and dozens of other honors. Last year, the band released their 8th studio album, a girl a bottle a boat, via Columbia Records spawning the lead single, “Play That Song,” which went platinum in 4 countries including the US, hit Top 5 on the US iTunes chart, Top 10 at Hot AC radio, charted at Adult Top 40 and holds almost 70 Million streams on Spotify alone. 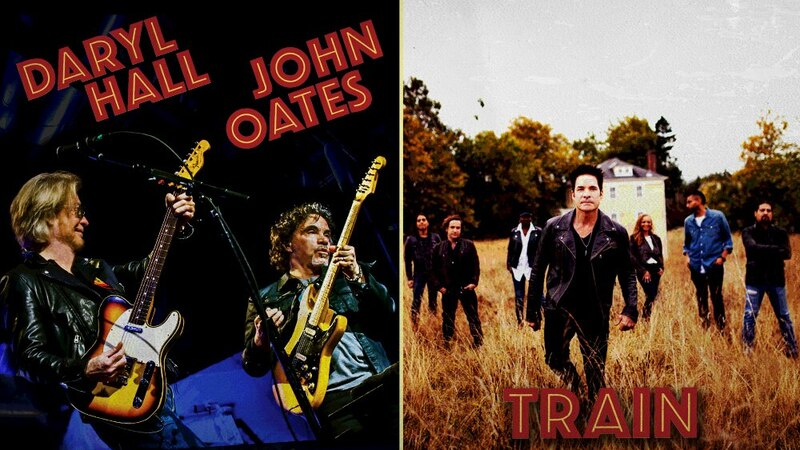 Citi® is the official presale credit card for the Daryl Hall & John Oates and Train tour. As such, Citi® cardmembers will have access to purchase U.S. presale tickets beginning Tuesday, January 23 at 10am local time until Sunday, January 28 at 10pm local time through Citi’s Private Pass® program. For complete presale details visit www.citiprivatepass.com.